Wil Wheaton. And Elijah Wood. Shay and Vella live in entirely separate universes, conjoined only by a recurring theme of over-protection and a call to adventure that leads them to question everything they thought they knew about the world around them. Separate, or so it seems – until Broken Age reveals that you’re very much in the same situation with its dual protagonists. Shay (voiced brilliantly by Elijah Wood) shuffles despondently to and fro on the corridors of a spaceship constructed for the sole purpose of keeping him safe. A cheery ‘Overmother’ robot wakes him in the morning, peps him up for the day while a mechanical arm selects his cereal, and issues him ‘missions’ in a series of happy-clappy environs populated by saccharine knitted companions to keep him occupied. He’s smothered. He longs for danger – anything but the usual routine. Vella (a husky and astute Masasa Moyo) and her home town, Sugar Bunting, are preparing for the Maiden’s Feast. Young girls in delicious confectionery dresses are offered up to appease the vile monster Mog Chothra, who duly eats them. Her Grandpa tells her of the days when the town was called Steel Bunting, and people fought the monster. People are sissies now, he says. Her suggestion that perhaps they should try to fight it again falls on condescending ears. She too, longs for danger. Just in case you thought this paragraph was going to be about Broken Age’s cover system and grenade-lobbing mechanic, we’re talking about a point-and-click here, so when that danger inevitably arrives it’s propelled more by narrative than real-time interaction. As the latter goes though, it’s interesting to play this so soon after Grim Fandango’s return and note – with some relief – how much less convoluted the puzzling is now. If you take pride in unpicking the kind of fiddly, multi-stranded logic knot that was de rigueur in pre-millennial adventuring you might find yourself feeling a bit like Shay does when he’s ambushed by another hug attack from his knitted pals. There are some isolated head-scratchers in here – including a particularly challenging, actual knot-based puzzle, ironically – but they’re rare. The emphasis in Broken Age is much more about letting the story, the spellbinding visuals, the movie-trumping voice acting, and the sense of place do their thing. With hypnotic results, I might add. That art style. I’d try to describe it, but the brushstrokes and colour palettes speak for themselves. Double Fine’s always known the value of minimising HUD elements to let the sense of place permeate, and here it’s almost invisible: a crosshair indicates where you’d like to move and objects you can interact with. Tap R1 and you’ll invite a slender inventory to the bottom of your screen, where you’ll sometimes combine items or pull them out to use on the world. That’s as videogame-y as it gets. The point-and-click sensibilities are time-honoured, but the execution still feels modern. Just know that you will remember how it felt to be a child for a fleeting second aboard the Bossa Nostra. You will stop and ask, “Hey, is that Wil Wheaton’s voice?” (It is.) You’ll get stuck at least once and try combining all the items you’re carrying with each other, but the soothing voices of Shay and Vella will melt away your exasperation. I don’t want to hear that you don’t like point-and-clicks. 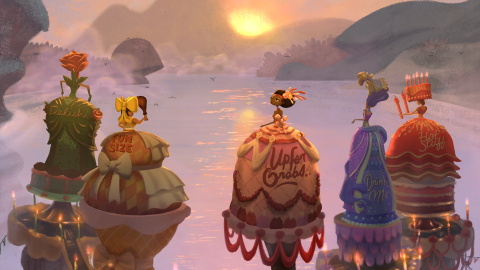 You like beautiful things, and Broken Age is truly beautiful. And that’s all you really need to know. Description Broken Age: The Complete Adventure brings both acts of Double Fine's point-and-click adventure to PlayStation 4 in one package.